RRM was created in 1987 by S scale modelers. The business was formed on the premise that the pursuit of high quality, precision brass models in S scale would be best served by S scale modelers focused on 3/16ths scale model railroading. Since our first imported model in 1988, River Raisin Models has introduced over 50 unique S scale products. River Raisin can also aid in your search for that hard-to-find, sold out after market brass import. Dan Navarre hails from Monroe, Michigan, home of the famous River Raisin. The French history of southeast Michigan places the word 'river' first. Dan has always liked the name and suggested it at the first 'Board' meeting...the rest, as they say, is history. Welcome to our web site. After browsing around, please contact us for further information. River Raisin was awarded the prestigious Readers Choice Award for S Scale Structures in July 2001 at the NMRA National Convention in St. Louis. We were excited to win this award since it is based solely on the readers choice among many other fine S structures. River Raisin Models for the Early Berkshire Project! The S Gauge Manufacturer of the Year at the 1993 NASG Convention, Valley Forge, PA.
River Raisin was awarded the prestigious Readers Choice award in the S Scale Rolling Stock category in 1993. If you are interested in ordering, please call, eMail or write us. We are available from 10:00 AM - 7:00 PM EST, 7 days a week. Phone messages may be left anytime. River Raisin Models is proud to introduce six versions of the Southern Pacific P-10 4-6-2 Pacifics. Boo Rim Precision will craft these models to the high quality you have grown to expect from River Raisin Models. They all will arrive with a Swiss Maxon Motor with DCC Ready wiring. Factory installed Loksound DCC will be available with a reservation. The production models are planned for a late 2019 arrival. All Photos Courtesy of Arn's Rail Photos. Click HERE for SP P-10 ordering information. The Master Craftsmen at Boo Rim Precision in Seoul, Korea will create a stable of great versions of this classic locomotive. They will all have that great detail that we all have come to expect from our Master Builders, including Swiss Maxon Motors and factory installed Loksound DCC if reserved. 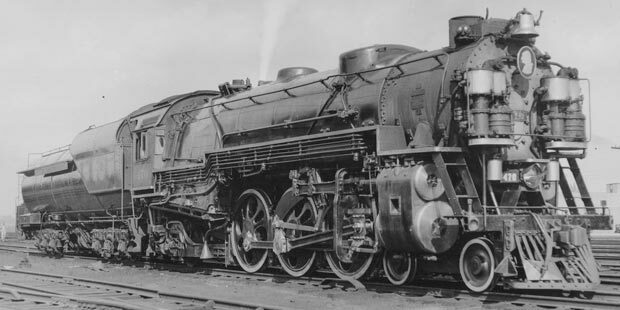 Locomotives to be built will include three versions of the F-17 and all five F-19 Georgian Style Pacifics. 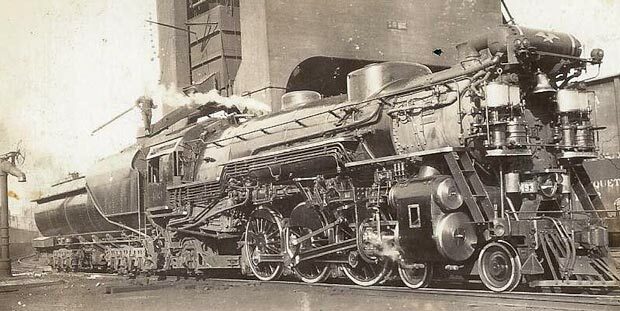 All locomotives were adorned with the fancy polished cylinder heads, stars, and either a bust of George Washington, an eagle, or star. These will be built in very limited quantities so get your reservation in soon to assure you get the model you want. Click HERE for C&O F-17a ordering information. Click HERE for C&O F-19 ordering information. 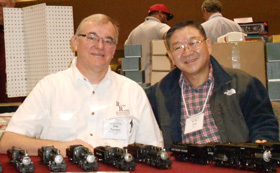 Dan Navarre and SeHo Jang, the owner of Boo Rim Precision, behind the display table at the O/S West Train Show in California, February, 2012. Both proudly showing off the new River Raisin Models USRA 0-6-0 production samples recently built by the Master Craftsmen at Boo Rim Precision.